Despite being knocked out of the World Cup, Brazil is still in the spotlight. The country is about to host the BRICS summit, where it wants to change global monetary policy with Russia, India, China, and South Africa. A new development bank and an alternative monetary fund are the most important projects expected to emerge from the three-day BRICS meeting in Fortaleza und Brasilia next week (14 - 16.07.2014). 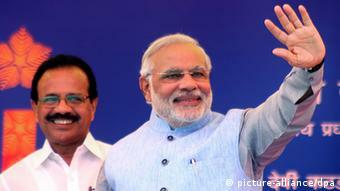 All five heads of state from the economic union of emerging powers are expected to participate. "The establishment of these financial institutions shows that the BRICS countries want to exert greater influence, in a constructive way," said deputy secretary at the Brazilian Foreign Ministry, Jose Alfredo Graca Lima. "They reflect the World Bank and the International Monetary Fund." The new development bank, with its capital stock of $50 billion (35 billion euros) and a financing capacity of $100 billion, will fund infrastructure projects in the so-called BRICS countries and in other developing countries. The new monetary fund will help countries struggling with balance of payments. It's been speculated in the Brazilian media that Argentina may be the first country to ask the new institution for a bailout loan. President Cristina Kirchner has already confirmed she'll be attending the summit of BRICS leaders on July 16 in Brasilia. There are still many unanswered questions about how the new financial bodies will work. Neither the seat of the institutions, nor the name, or criteria by which loans are granted, have yet been revealed. So far, only the financial volume has been fixed. According to the Brazilian Foreign Ministry, the fund has $100 billion at its disposal: China's deposit amounts to $41 billion, while Brazil, India, and Russia will contribute $18 billion each, followed by South Africa's $5 billion. The launch of the fund is being seen in Brazil and elsewhere as a response to the lagging reforms in the International Monetary Fund (IMF). During the spring meeting of the World Bank and IMF in April, the US Congress vetoed a reform package adopted by the IMF in 2010 that called for changing voting rights to the benefit of emerging and developing countries by six percent. "Everyone wants more flexibility," said economist Lia Valls Pereira of Brazilian think tank Instituto Getulio Vargas. "The BRICS states are showing the USA that changes are possible." The fund and the development bank could also help build a common identity among the BRICS nations. Deputy secretary Lima admits that such steps are still in their infancy. "It is easier to say what the BRICS are no more than a sum of their parts," Lima said. "They are not an international organization, not a tax union, and not a free-trade agrea. They are more like a cooperation mechanism that has proved useful." So far, cooperation has concentrated on trade wtih China. Brazil's exports to China totalled about $1 billion in 2000 and grew to $46 billion in 2013. China replaced the United States as Brazil's largest trading partner in 2012. Brazilian exports to Russia, South Africa, and India, on the other hand, have increased more modestly. According to the Brazilian Foreign Trade Ministry, exports to India were worth $1.3 billion in 2013, exports to Russia reached nearly $3 billion and Brazil exported $1.8 billion worth of goods to South Africa. 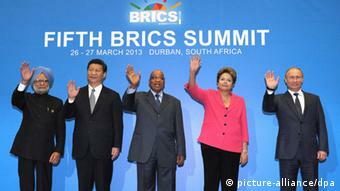 BRICS states are also politically united in their desire to see changes to the United States' hegemonial trade power. 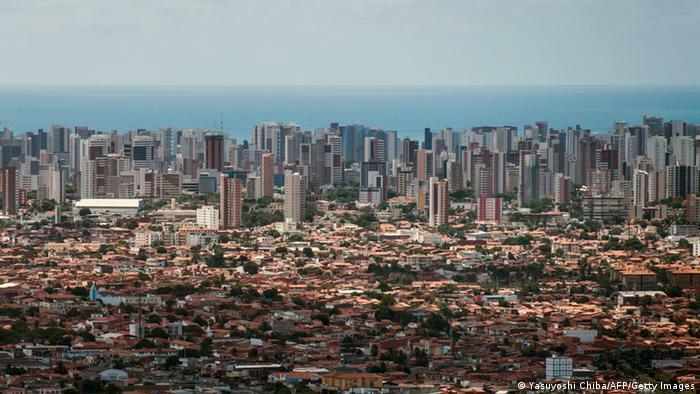 The foundation of these financial institutions, loosely modelled on the Bretton Woods conference that regulated international monetary and financial transactions after World War Two, could make the summit in Fortaleza a historic event. For Brazil, the summit represents the second international event to take place in the country after the World Cup. With leaders from China, India, and Russia visiting Brazil, the four-day summit will be of major importance to the BRICS states. Whether it is also important to the rest of the world is unclear. Unlike summits of the G-8, where political hot-button issues often overshadow the established agenda, Russia and China as well as India, South Africa, and Brazil agree there are topics the BRICS organization should not get involved in. Brazilian Foreign Minister Figueiredo Machado made that clear when he said, "BRICS and Ukraine - those are topics that should not be mixed together."